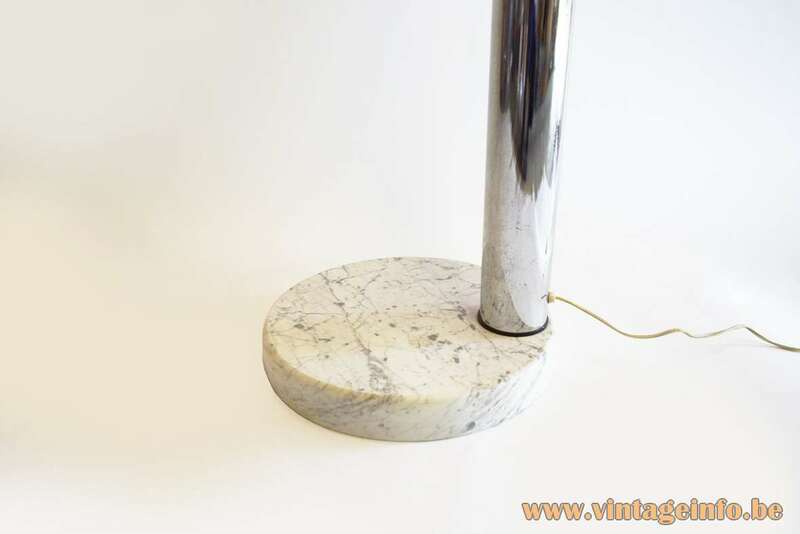 Materials: Round Carrara marble base. Chromed metal curved rods, rotatable in any direction. Chrome pole. 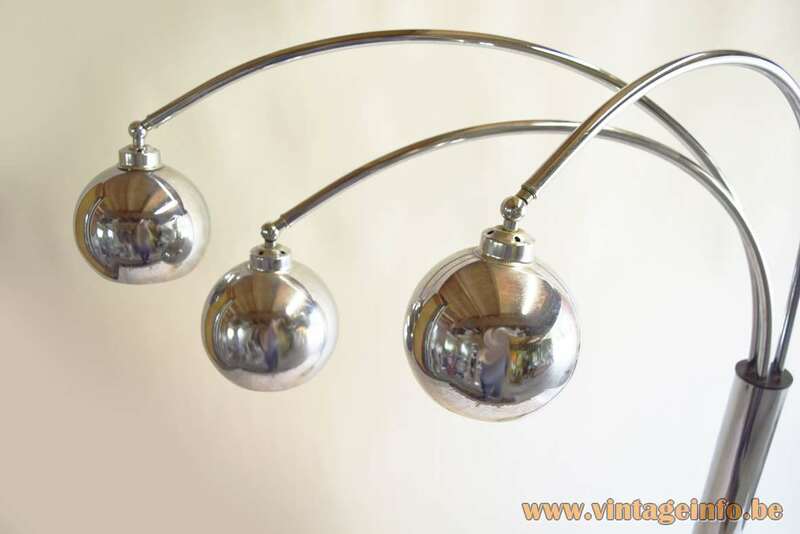 Chrome eyeball lampshades, white painted inside. Some plastic parts. Bakelite sockets. Manufacturer: Massive, Mortsel, Kontich, Mortsel and Wommelgem, Belgium. 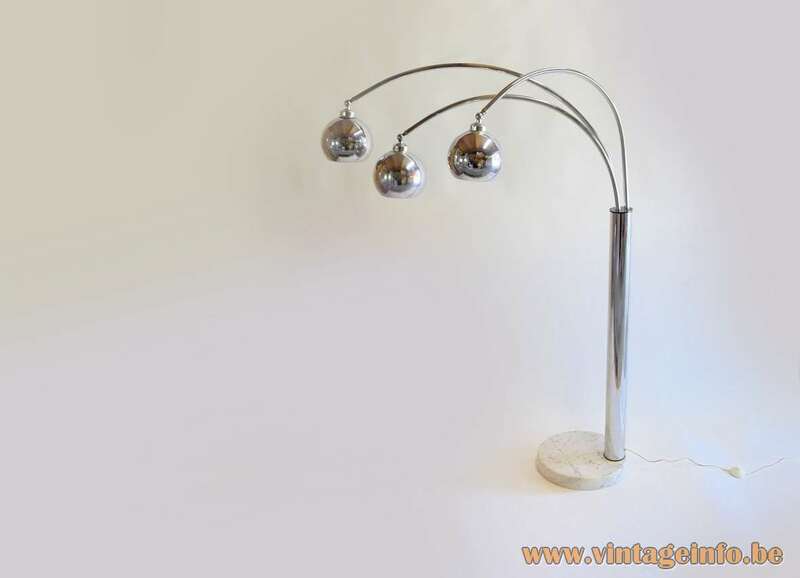 Other versions: Also made with a chromed base or a black marble base. Made with many different lampshades. Also produced in a completely white painted version. 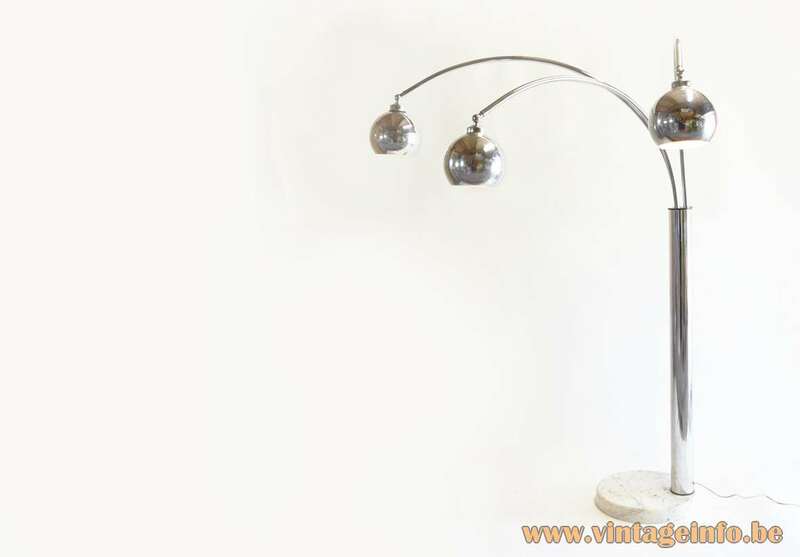 These floor lamps were made with 3 or 5 lamps. During the 1980s a version with halogen spots was made. 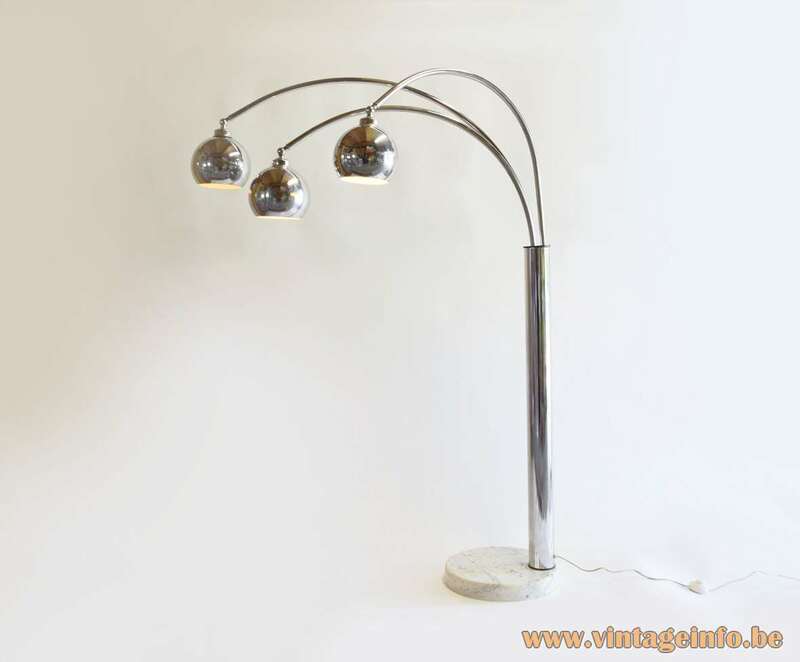 Similar floor lamps were produced by the Italian company Reggiani. Rumor has it that Reggiani produced these lamps for Massive. But there are some differences. 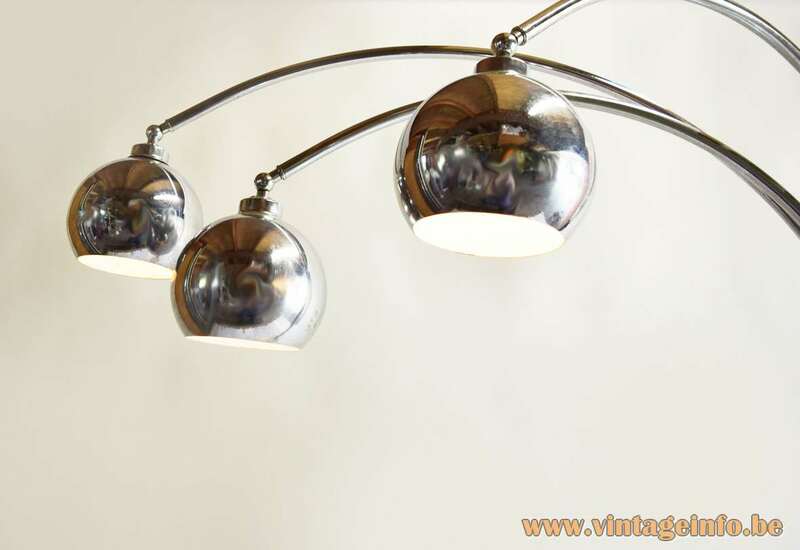 The most striking dissimilarity is that the eyeball lampshades are different and have another connection to the rod, as you can see below. 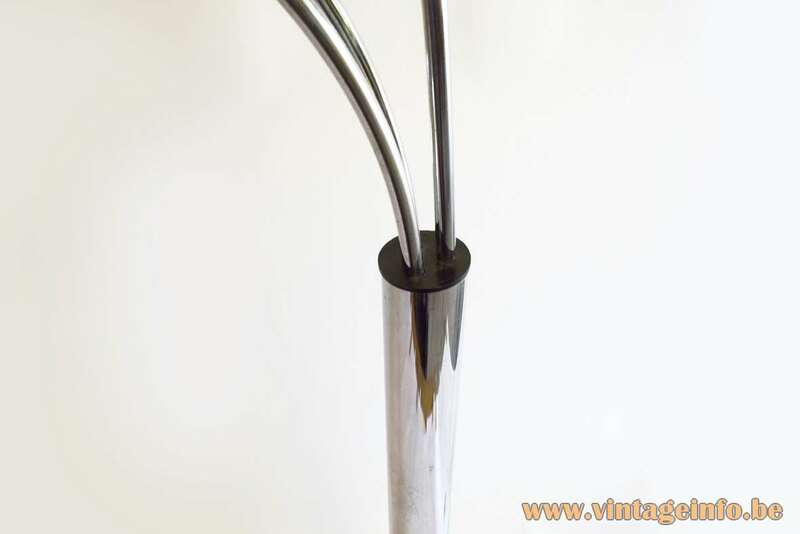 The black plastic center point were the swivable rods appear is made of metal at the Reggiani floor lamp: a much better quality. Goffredo Reggiani (1929 – 2004) founded the company in the Italian town of Monza in 1957 and designed most of the lamps himself. In the beginning Goffredo most often used plywood and sanitized opaque glass in his designs as you can see in this example, giving his lights a Scandinavian look. Later in the 1960s and 1970s his interest shifted towards brass and chromed metal. The Reggiani company still exists. A Reggiani eyeball floor lamp was used as a prop in the 2018 film Bohemian Rhapsody. A biographical film about the British rock band Queen.